It was straight-line-meets-circle-track Thursday morning (April 27) at Charlotte Motor Speedway and zMax Dragway in Concord, N.C., as the star drivers of the NASCAR Camping World Truck Series got a chance to swap seats with some of the ace pilots from the NHRA Mello Yello Drag Racing Series and get themselves a taste of nitromethane. 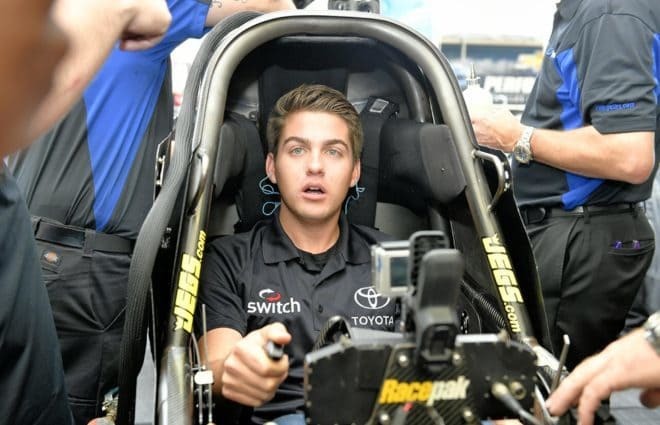 First up were some hot laps at Charlotte in a pair of Toyota Camry Hybrid pace cars, with the NHRA drivers riding shotgun as the NASCAR boys took them around at around 80 mph. After a few laps of orientation, the NHRA drivers took over the driver’s seat and tried their best Ricky Bobby impressions, looking to frighten their NASCAR counterparts by moving right up against the outside wall. Todd turned in some impressive lap times for a driver who doesn’t normally make turns on the racetrack. Langdon had tried to give the crowd a smoky burnout as he left the pits, but the Camry Hybrid wasn’t up to the task. 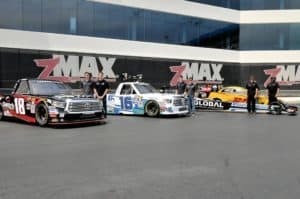 After turning a few laps, the action shifted to zMax Dragway as Langdon and Todd showed off their rides to the four NASCAR drivers, none of whom had ever been to an NHRA event before. They were in for quite an introduction. After a brief orientation on the cockpit layout, Langdon helped Gragson strap into his Top Fuel machine to bring 10,000 horses to life. Langdon’s crew fired up the engine, and the look on Gragson’s face said it all. “That was awesome,” Gragson said. “I can’t imagine driving one of these things. These guys have some guts. That is all. The entourage then rolled on a few pit stalls down to Todd’s Kalitta Motorsports Funny Car team, where the NASCAR drivers got a look at the slightly roomier cockpit of the DHL-sponsored machine. Bell was the first to climb into the driver’s seat as they cranked up the car, only this time Todd’s crew cracked the throttle open just enough to cause everyone in attendance to jump back five feet. Truex took his turn in Todd’s ride and was equally surprised by the experience. For the finale, the party moved over to the zMax starting line, where Langdon and Todd performed a burnout for the crowd. That came as a delight to the four NASCAR drivers, each of whom had no idea what to expect. Gragson, for one, was caught completely by surprise when the car launched off the starting line. Tags Christopher Bell Grant Enfinger JR Todd Noah Gragson Ryan Truex Shawn Langdon Troy Coughlin Jr.
Next Friday Face-off: Who’ll Fill These Ginormous Shoes?